A subscriber has asked what THC knows about the composition of the Bimini Inlet marble "pillar pieces." This sent the geologist W. Harrison, also known as writer William Hutton, scurrying through his old correspondence files for a couple of 1978 letters from Professor Harmon Craig and his wife Valerie, then geochemists at Scripps in La Jolla, California. Fig 1. Map of the Bimini Islands, showing locations of materials referred to in text. Bathymetric contours are in fathoms. But first, let us look at the locations of the pieces of marble pillars in question. 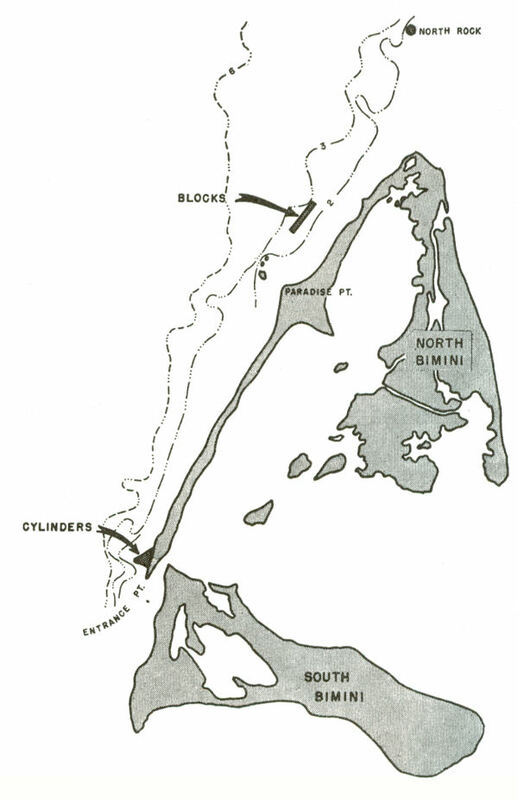 Figure 1 shows that the pillars are amongst the cylinders at the western shore of the point of land emanating from North Bimini, or at Entrance Point. 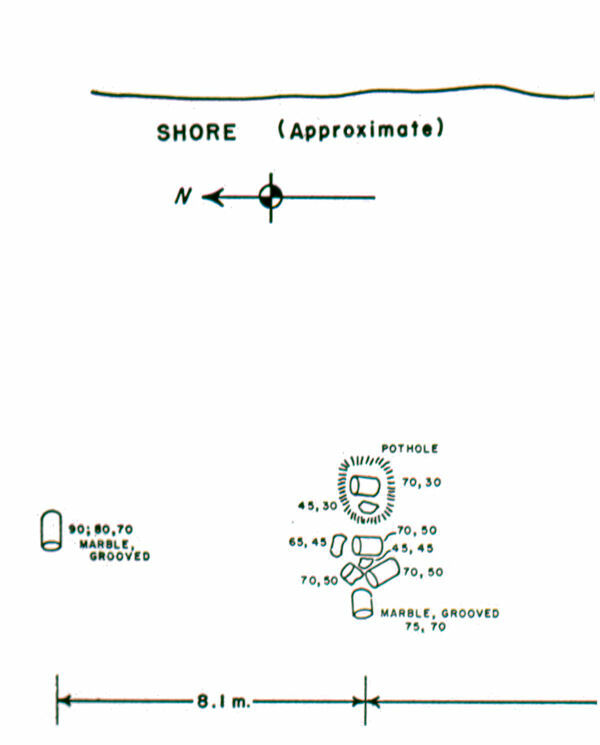 Figure 2 shows the locations of two, grooved marble cylinders in the field mapped by W. Harrison and colleagues R. Byrne and M. Lynch in 1971. A thin-section examination of one of the marble samples indicated that it consisted of about 90% calcite, 8 % quartz, and a remainder of muscovite, pyrite, and sphene. Thus, Harrison suggested that the marble was "the metamorphosed equivalent of a calcite-rich limestone containing a small amount of clay." But what can be said about the provenance of the marble pieces? Provenance in geology means "a place of origin;" specifically the area from which geologic materials came. To get an idea of the provenance of the marble of the cylinders, Harrison sent a sample to the Craigs because he knew that they had been doing carbon and oxygen isotopic-ratio analyses of the marble samples they had collected from classical quarries they visited in their travels. Little did he know that another individual, a woman named Henriette Mertz, had also been to Bimini and had sampled marble there. But there is some confusion in the location of Mertz's sample. Mertz apparently told Valerie Craig that she had sampled a marble specimen at Paradise Point (see Fig. 1), and both Craigs then assumed that Harrison's sample was also from there as well. But this was not the case. Harrison's sample was from Entrance Point (Fig. 1). The error in location was propagated, however, in the letters from the Craigs to Harrison and Mertz. Turn now to those letters for the conclusions made as a result of the Craigs' laboratory work and personal knowledge. No additional speculations as to the provenance of the Bimini marble samples have been made by Harrison, as of this writing. His friend, Harmon Craig, is now dead. After all this work, one at least has a notion about where the the marble did not come from. Harrison, W., 1971, Atlantis Undiscovered, Bimini, Bahamas, Nature, v. 230, No. 5292,pp. 287-289. We have just recently returned to our marble work. The last six years have been fully occupied with the International Decade of Ocean Exploration survey of the world's oceans (GEOSECS) involving many months at sea and years of analyses of samples collected, plus ongoing work in geothermal studies, earthquake precursors, etc. We have, however, finally analyzed both the sample you sent and one from Professor Wyman Harrison with quite similar results. They are entirely. unlike any of the quarries from Greece, Italy, India and Asia Minor we have sampled, and are also unlike any of the archaeological specimens we have analyzed. I have plotted on the enclosed graph your "pillars" and sketched in the major quarry areas we have covered. You can easily see how different the Bimini samples are from the classical Greek quarries. The Bimini marble is somewhat like some of the New England marbles, e.g. the West Rutland marble in Vermont, which has delta values of +1.2 and -8.5 (carbon and oxygen, respectively). The New England marbles are somewhat higher in C-13, though only a few have been analyzed. The Murphy marble from Tate, Georgia, is also somewhat similar (carbon = +1.3, oxygen = -9.3); again it is higher in C-13. The only other marbles we know of which are isotopically like the Bimini sample are marbles of the Swiss Alps and Italian Tyrol, specifically the Simplon Tunnel marble at Crevola, the Predazzo marble in the S. Tyrol at Canzocoli, and the marble at Bavonatal. Marbles from these three areas are identical (carbon = 0 to 0.5, oxygen = -8.1 to -8.2) to the Paradise Point samples. Perhaps the Bimini marbles are ballast taken from the Simplon Tunnel! Well, it is all very interesting, and we hope some day a solution to the provenance of your pillar specimens will be found as well as an explanation of how they came to be in the waters off Bimini. The Paradise Point, Bimini marble has at last been analyzed. Three oceans and three seasons of work on Lake Tanganyika and the Kenya and Ethiopian Rift Valleys have intervened, to the detriment of the marble work. The laboratory has been completely occupied with a complete geochemical survey of the Atlantic, Pacific, and Indian Oceans, and we have just returned from the final stage of the Indian Ocean program. So there is beginning to be time to catch up. The enclosed plot, made by Valerie, shows the isotopic results on your sample and also on a sample which was sent at the same time by Henriette Mertz - a copy of the same plot is being sent to her. Both samples have the same carbon and oxygen isotope ratios and the values are quite different from any of the classical quarries we have analyzed. This includes the Italian Carrara marble (not shown). The Bimini marble is somewhat like some of the New England marbles, e.g. the West Rutland marble in Vermont, which has delta values of +1.2 and -8.5 (carbon and oxygen, respectively). The New England marbles are somewhat higher in C-13, though only a few have been analyzed. The Murphy marble from Tate, Georgia, is also somewhat similar (carbon = +1.3, oxygen = -9.3); again it is higher in C-13. The only other marbles we know of which are isotopically like the Bimini sample are marbles of the Swiss Alps and Italian Tyrol, specifically the Simplon Tunnel marble at Canzocoli, and the marble at Bavonatal. Marbles from these three areas are identical (carbon = 0 to -0.5, oxygen = -8.1 to -8.2) to the Paradise Point samples. Perhaps the Bimini marbles are ballast taken from the Simplon Tunnel! Of course, there are lots of marbles we haven't analyzed, and this composition is probably fairly common, -- there are lots of limestones in this range. If you want the detailed references to the Alpine samples let me know - the work is by Baertschi in 1957 and I can look up the reference. Sorry this took so long, but anyway no great discovery has been missed (it seems).